We’ve researched our industry and government resources for good statistics on the energy efficiency of insulated SPF roofing, but there are so many combinations of buildings, materials and other variables, there’s no formula that would apply to every given situation. Online “do-it-yourself” calculators for estimating potential energy savings – even those on government sites – can produce unrealistic figures. It does no good to overpromise or overstate how much one of our systems could reduce a customer’s utility bills. But, we can pass along what we’ve gleaned from DFW Urethane customers as part of our ongoing research. Here are three projects involving different types of roof and facilities, but of a similar size (25,000-30,000 sqft.) No other changes or upgrades were made to customers’ AC units, few of which were high-efficiency models. Also, results do not reflect that costs/kwh have actually gone up since we did these roofs. 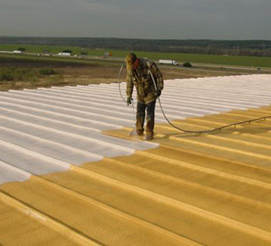 We sprayed all three facilities with 1.5” of foam roofing, equivalent to an R-value of 9.6. Each was covered with a Neogard Energy Star-rated reflective roof coating. Grocery store – This grocery store south of the DFW Metroplex has an R-panel metal roof. Its electric costs are heavily driven by keeping in a lot of refrigerated air – a challenge compounded by a glass-covered storefront, with doors that are constantly opened and closed. Our customer reported a 22% dollar decrease in their utility bills. Commercial building – This building close to downtown Dallas is used to house electronic game machines and other vending equipment. Our customer sought long-lasting leak protection for their modified bitumen roof. Prior to the installation of our spray polyurethane foam roofing system, the company was paying its utility provider approximately $40,000 per year. Afterwards, its energy bills have been averaging just $28,000 per year – a cool savings of $1,000 every month. Suburban office building – This single-story office building in Richardson, Texas had a built-up tar-and-gravel roof. Our technicians vacuumed up gravel, then applied the closed-cell polyurethane foam and reflective elastomeric coating. Like many flat roofs, it had ponding issues that contributed to water leaks, so we also filled in low-lying areas with extra foam to improve drainage. With their insulated SPF roof, the customer is paying 33% less in utility bills. All three customers are grateful to finally have roofs that keep water from leaking inside. Once they realized they no longer had to sweat every rainstorm, they noticed their utility bills were much lower. In fact, they are all on track to recoup their reroofing costs in energy savings within roughly 4 years. At the other end of the size scale, in 2001 we reroofed a heavy industrial building with very high ceilings that manufactures high-performance aircraft components. 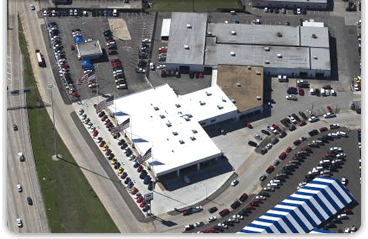 Its standing-seam, galvanized metal roof spans approximately 150,000 square feet. Prior to the roof installation, the customer had been operating three industrial chillers, each the size of an 18-wheeler, to maintain a cool environment for the temperature-sensitive materials. Since the foam was installed, they’ve only needed to operate one.